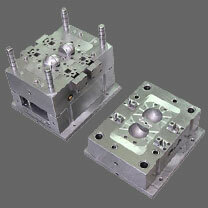 There are only four primary variables in injection molding process that the plastic knows. They are: cavity pressure, melt temperature, flow rate and cooling rate. It is these variations in these four basic plastic conditions that can cause or solve part problems. For the warpage problem it is likely that the suggestion to run the core and cavity half of the mold at a different temperature was the most effective. This is because cooling rate differences on the core and cavity affect crystal size for this HDPE and the retained molecular orientation. Any differences in either of these cause shrinkage variations resulting in warpage. Since there is usually more plastic to be cooled on one side of the part than on the other, that side requires more cooling. Usually the core half must be run, at a lower temperature because cores are harder to cool and often have more plastic to be cooled. So, setting cooling temperature differences is probably the best option though getting completely rid of warpage particularly on HDPE can be difficult. Usually more than one of the four primary variables can affect any part problem. The suggestion to raise the mold temperature may help by giving more time for crystals grow uniformly (for a semicrystalline plastics such as HDPE). But at the penalty of longer cycle time. A change in flow rate might help in some cases will help by reducing molecular orientation. Perform a mold flow analysis on the part especially concerning residual stresses, gate size and location and cooling channel location. This process is still on going so I really can't comment on the results. Heating the mold helped considerably. Differential heating also helped (20C temperature difference between mold sides). Low pack and hold pressures. Use of fillers actually made things worse. Making sure mold temperature is constant. Making sure wall thickness is constant;. Increase temperatures in the central nozzles were never tried. Nucleating agents didn't help much.